Hi crafty friends and happy summer. It is HOT, HOT, HOT where I am in the northeast USA! No denying that it’s summer. Tomorrow is the 4th of July holiday here in the US and nothing says 4th of July and summer better than a Patriotic color theme. 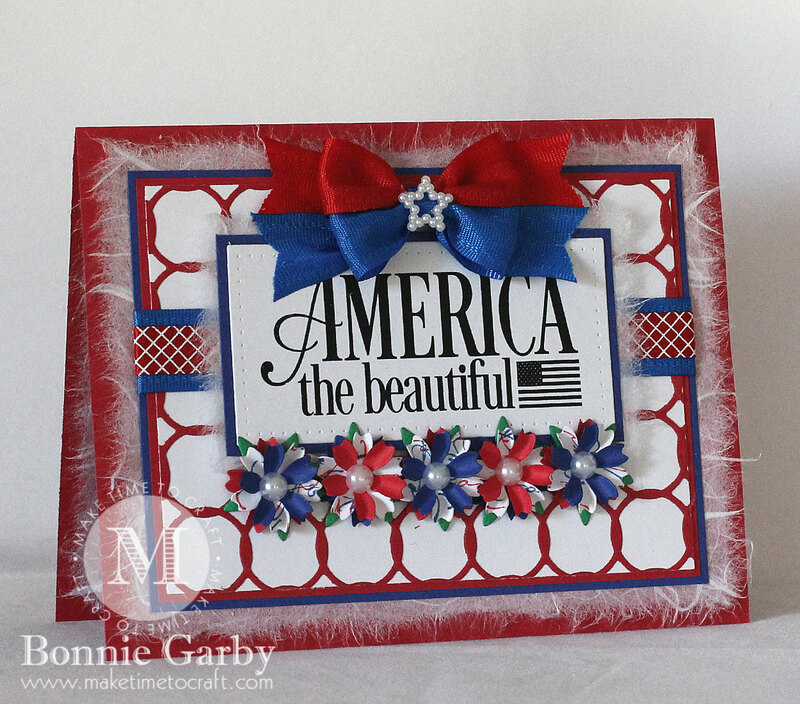 This note card was created with some pretty dies from Cheery Lynn Designs and gorgeous ribbon and embellishments from Really Reasonable Ribbon. This is a very simple design where I let the Lattice Frame as the background do all the work along with the small and simple Sweet Christine Flowers. I just cut the Lattice frame in red and adhered it to white cardstock and then added a red and blue layer beneath it. I wrapped some pretty ribbons around that unit and then at the very bottom you will see a layer of wispy white mulberry paper. I then topped that with the sentiment panel which was also layered with blue cardstock and white mulberry paper. The flowers are very easy to assemble. 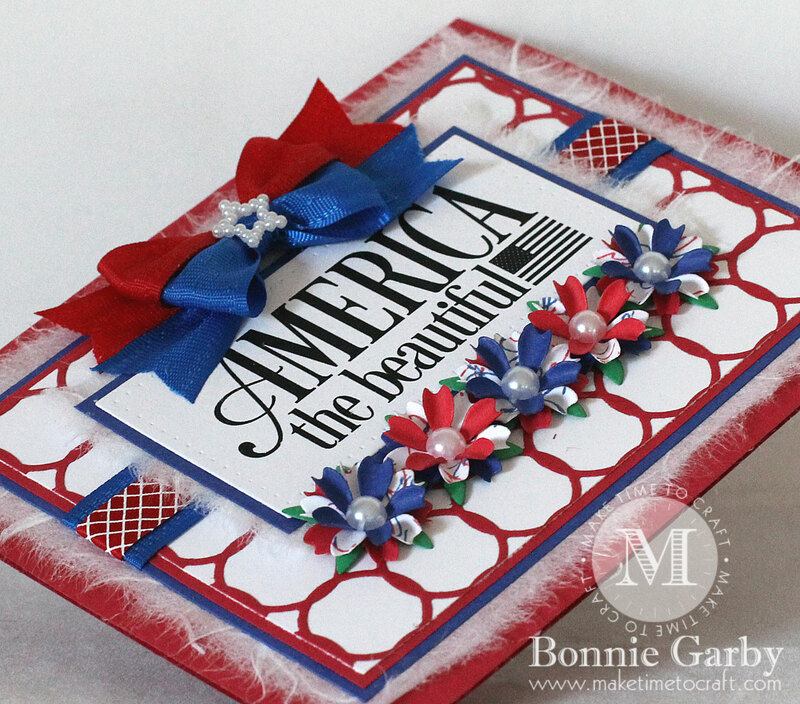 I cut the flowers in red, white and blue cardstock. I inked the white pieces in red and blue with an old script background stamp. I then shaped the petals with a needle tool and glued the layers offsetting the petals for each new layer. I then added the leaf layer to the base before adhering them under the sentiment panel. My card was topped off with a pretty bi-color bow created on my Bow-it-All V3.0 Tool with Delicate Stitched Ribbon in Red and Electric Blue from Really Reasonable Ribbon. The center of the bow is adorned with a pretty Star Shaped Pearl Embellishment. Great card! Thanks so much for joining us at the Simon Says Stamp Wednesday Challenge! 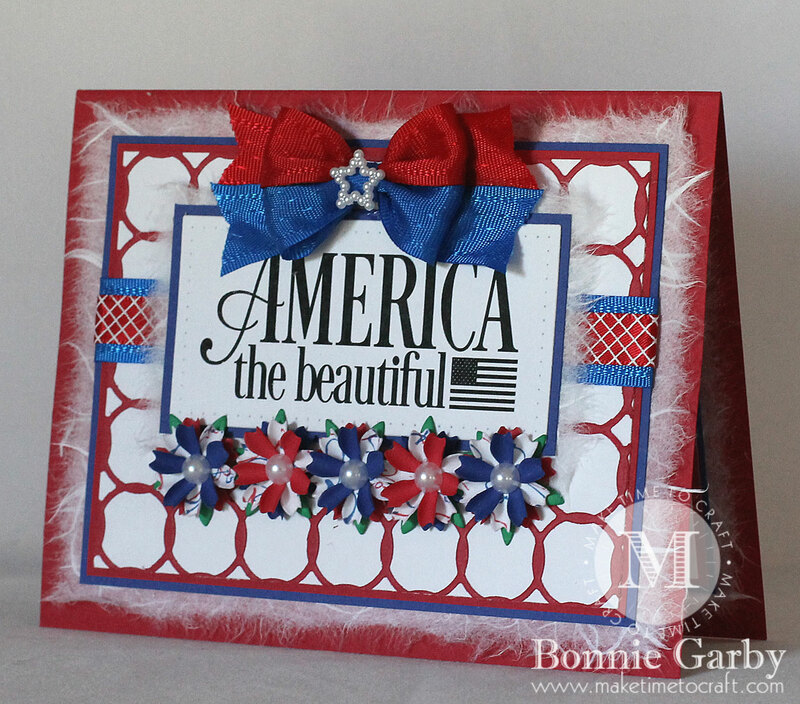 Great summer/4thJuly card, Bonnie! It’s verrry hot down here in NC! Thanks for joining us at 4 Crafty Chicks this week! Happy 4th! Happy 4th July! This is a brilliant card, I particularly like those flower embellishments. Glad you dropped by at 613 Avenue Create. 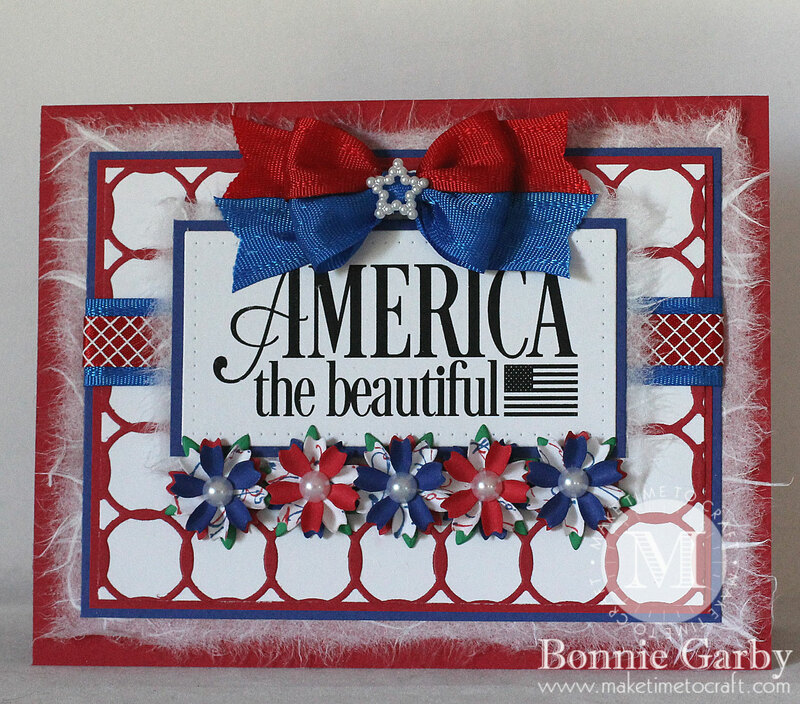 This is a beautiful card – hope you had a great 4th July!